Over one million children under the age of sixteen died in in World War II, not because of the bombs, but because they did not fit in as Hitler’s image of the "perfect" German. Many children and their parents living in countries, which had been invaded by the Germans, were imprisoned and killed because they were Jewish. Jewish people follow the religion known as Judaism. They are Jews. Anne Frank was an ordinary German Jewish girl. She enjoyed playing with her toys, riding her bike and going to the seaside. Why is Anne Frank Famous? Anne Frank is well known because of her diary. It was first published as a book, in Dutch, in 1947. Since then, millions of people have read the thoughts and hopes of one young girl and have been inspired by them. Why were Jews imprisoned and killed during World War Two ? Hitler wanted to create what he saw was the perfect German, this meant that anyone who did not fit into his perfect image was persecuted (ill treated) and/or killed. Hitler persecuted German citizens who were Jewish, Gypsies, or otherwise "undesirables". How many people were killed because of their religion? By the end of World War II, six million Jews were killed because they were, in Hitler's eyes, 'different'. What was life like for a Jew living in Germany? Anne Frank and other Jews were forced to think they were lower and inadequate to everyone else just because they had a different religious belief. Why is Anne Frank's diary important? Through her diary "The Diary of Anne Frank", people all over the world are able to see what life as a persecuted Jew was like during World War II; thus gaining an appreciation for the sacrifices people made in the struggle to stay alive. Anne describes in her diary how she felt while she was in hiding, and how it was very hard to survive in such a small living space. When did Anne receive her diary and what was the occasion? Anne received on her 13th birthday in 1942, a diary from her parents. What did she name her diary? Anne called her diary 'Kitty'. Anne Frank did not become famous until after her death in the Bergen-Belsen concentration camp and after the liberation of all concentration camps. Otto Frank, the only surviving member of the people hiding in the Secret Annex, later had Anne's dairy published. 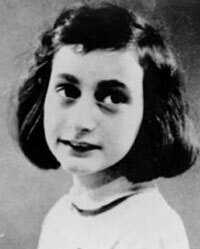 June 12, 1929 - Anne Frank born in Frankfurt, Germany. Anne Frank and her family move to Amsterdam 1933 where they hope to be safe from the Nazi Germans. May 1942 - all Jews aged six and older are required to wear a yellow Star of David on their clothes to set them apart from non-Jews. August 4, 1944 - Their hiding place is discovered and they are arrested. September 3, 1944 - Frank family are transported to the Auschwitz death camp in Poland.